Dear Lovely Confetti friends! I’m writing to you today with some very BIG news to share. I am listening. I have used your feedback from day one to direct my decision making from year to year and moving into 2019 is no different. The “WordPress Themes” industry has changed drastically over the past 3 years since I began in 2015 and I want to make sure that I continue to adapt to best serve the creative community…to best serve YOU. I know that other plaforms have appeared like Squarespace, Showit or very powerful constructors like Elementor or Divi. I have always been specialized in templates based on the Genesis Framework but now I also want to design in other Frameworks with more flexible constructors. Soo.. I’m working on a a new Divi Child Theme Collection. It was released in December 2013 and it’s become the most popular WordPress themes of all time. Sites which have designed by using Divi theme has the fastest loading sites on Google. It has been built to liberate non-coders from the limitations of their lack of development skills. This is achieved via the Divi builder, a drag-and-drop tool that’s integrated into the theme. Halle is the first Divi child theme I´ve designed. It comes with a truly versatile and beautiful design that fits many different looks — freelancer, photographer, event planner or even a standard blog. Halle is easily customizable; you can modify the colors, buttons, links, hovers, sections,.. or integrate other features with Divi Visual Builder . 14 pages layouts included (Home, About, Contact, Gallery, Pricing Table,…). 3 navigation styles ( split navigation, aligned to right or below logo). 1-click install process and step by step instructions you will be up and running immediately. These are just a few of the functions that you can get from this elegant theme. You can see it live by clicking the demo button below. Happy thursday my friends! I wanted to introducing Kate a feminine Photography WordPress theme in the shop, Etsy Shop and Creative Market. 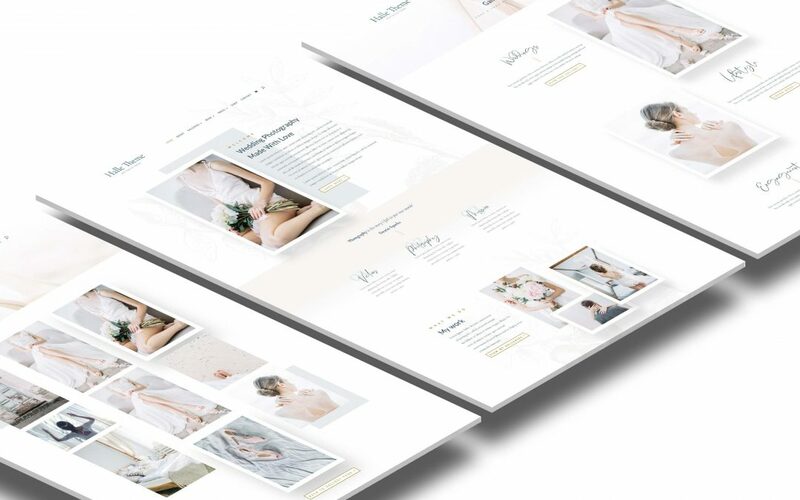 Kate is a modern, sophisticated and clean WordPress theme designed for you to create your own gorgeous and eye-catching with feminine website. Its minimalist style makes it especially well-suited for photographers, bloggers, creatives. This theme is clean, pretty, and super easy to navigate with a lot of options, that can help customizing you blog, changing Google fonts, colors, posts layouts and more. I designed a color palette and mood board based on fresh spring colors (greens, blush and sand). I´ve choosen two gorgeous Google Fonts that combines perfectly, Playfair Display and Nunito for body text. And finally this is the new WordPress theme!! Slideshow on Homepage allows you to showcase any content you want. This enables you to display flexible top section in 3,6,4 or 8 widgets. Use the default color scheme or change colors and typography to match your branding (+ 300 beautiful Google fonts) and preview these changes in real time. Custom Filterable Portfolio allows designers, artists, photographers to show off their projects, images or gallery to your site. (see it: portfolio). Choose two, three or four columns layouts and allow your readers filter by categories. WooCommerce is a free eCommerce plugin that allows you to sell anything, beautifully ( physical, digital or affiliate products to earn commission ). I´ve customized style making the plugin perfectly integrated in theme (see it: shop). Fully responsive across all devices — looks great no matter how you’re viewing it (desktops, tablets, and phones). Delays the loading of widgets until the user scrolls to them. This will reduce loading time on long pages with lots of images. Choose to have full width pages, with 1 or 2 sidebars on the left or right. Sticky menu on scroll and floating back to top button help your visitors find the content they’re looking for quickly, without fuss. >> Display a beautiful newsletter widget compatible with MailChimp, Aweber, MailPoet, ConvertKit,..
Add mailing lists forms and calls to action to widgets, an ideal way to convert more of your website visitors into active leads or email list subscribers. Category index page collects images and content from different posts categories creating a single destination where visitors can browse content easily. (see it: category index). A Coming Soon page and landing page is a temporary home page telling visitors that your site is under construction or announcing something. Theses pages do not have a header or footer and therefore, visitors are unable to navigate to the rest of your site. This provide a user-friendly way to get your visitors more engaged and browsing deeper into your website without any plugin. You can add a video background in certain areas instead of full-width images. Full-width footer area for beautifully displaying your Instagram photos. Feel free to check out this new WordPress theme. I have some exciting news.. I´d like to to introducing Holly a feminine Photography WordPress theme in the shop, Etsy Shop and Creative Market. Holly is a clean, minimalist and elegant and powerful multipurpose WordPress Genesis Child Theme ideally suited to blogs or creative businesses. This theme is been crafted with your visitors in mind, with a focus on striking and enchanting components with a flexible design with a lot of options, that can help customizing you blog, changing Google fonts, colors, posts layouts and more. I built this fresh moodboard that kept inspired to build the new WordPress theme. As you can see, this moodboard takes inspiration from fashion, while adding a bit of texture to help round out that vintage vibe. And finally I got to design the WordPress theme!! This enables you to display flexible top section in three, four or five.. widgets. Use the default color scheme or select your own color palette and typography (+ 260 beautiful Google fonts) and see a preview of these changes in real time. Awesome Filterable Portfolio allows designers, artists, photographers to create, manage and publish your most recent projects, images or gallery to your site. (see it: portfolio). Choose two, three or four columns layouts and allow your readers filter by categories. WooCommerce is a free eCommerce plugin that allows you to sell anything, beautifully ( physical, digital or affiliate products ) to your audience today. I´ve customized style making the plugin perfectly integrated in theme (see it: shop). Responsive Web Design respond to the user’s behavior and environment based on screen size (desktops, tablets, and phones). >> Mailing list integration for MailChimp, Aweber, MailPoet, ConvertKit,..
Related posts in the footer of your entries has proven to be quite effective in making your readers stay on your site a while longer and perhaps navigate to another page while they’re at it. Many people who have bought some of my WordPress themes ask me How to fix blurry photos in WooCommerce so I´ve decided to make a really fast instructional tutorial. 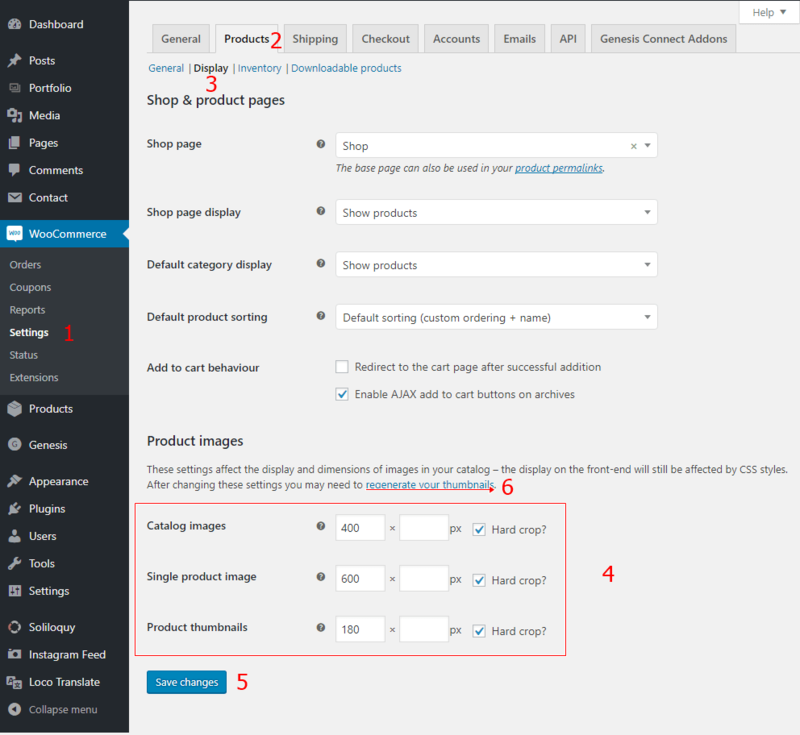 If you’re having issues with your WooCommerce product images being too small, blurry or too big, this may be because of the image you’ve uploaded do not match your WooCommerce product image settings. First of all you should enter site admin panel and navigate to WooCommerce > Settings. Under the Products tab you should see the Display option, which defines the product images dimensions Width X Height in pixels. We need to change them. Catalog Image is for your images on the shop page and for widgets. Single Product Image is for your images on the single product pages. Product Thumbnail is for your smaller product thumbnails. The photos you upload to products will be resized to match the values you have input here. If your settings are 100×100 and you upload a 300×600 image it will be resized to 100×200. You can also choose to ‘hard crop’ your images which will force them to be the size specified in these settings, regardless of the raw image you upload, but will be cropped rather than distorted in scale. 4. The minimum suggest width for images is 600px. If you do not want the image cropped, leave the height field blank. 5. Once you have made your changes to the image dimensions, click ‘Save Changes’. 6. If you change the image dimensions after you have uploaded product images, you will need to download and run the Regenerate Thumbnails plugin just once Regenerate Thumbnails – this is to ensure that all affected images are resized to match the new dimensions. That concludes my tutorial for fixing the blurry product images on your WooCommerce shop. Today, I´m introducing Julia a feminine WordPress theme for lady entrepreneurs, photographers and creatives in my shop, Etsy Shop and Creative Market. Julia is a cutting edge and impressively multipurpose WordPress theme built for flexibility and intuitiveness with parallax scrolling to give you the ability to have the look and feel you want for your site. This theme is customizable and highly flexible feminine WordPress handy for implementing modules for things like contact information, products, posts, pricing table, galleries, and recent reviews focused on designers, freelancers, photographers, artists,..who want to showcase their work. This moodboard that kept me inspired to craft the new WordPress theme. An inspirational moodboard with soft colors and textures (Charcoal, sand, pink, mint and slate). I´ve choosen two lovely and elegant Google Fonts that combines perfectly together, Cormorant Upright for headings and Khula for body text. 4 custom backgrounds image which involves the web page’s background moving at a slower rate to the foreground, creating a 3D effect as you scroll. This enables you to display flexible sections in front page ( one, two, three,.. widgets per section). Change colors, typography (+150 Google Fonts) , blog archive ( grid layout, post excerpts, full posts,..), logo,… and see a preview of these changes in real time. This useful feature allows organizing your recent projects with ease. (see it: portfolio). Choose between two, three or four column layouts and allow your site visitors filter by categories. To help you create an online store (see it: shop). Install WooCommerce plugin, activate it and will be applied the shop layout including cart, checkout, and account. Theme has a fully responsive layout so the content will adapt to any device. Load widgets when scrolling down improving website performe as Browser will be in ready state after loading visible images. Sticky menu on scroll and floating back to top button allows users to smoothly navigation through website. Category index is a special page to showcase your post categories. (see it: category index). Related posts functionality has proven to be quite effective in making your readers stay on your site a while longer and perhaps navigate to another page while they’re at it without any plugin. There are four footer widget areas to display any kind of widgets you like. Make your visitor watch the animation before the site loads. Blog and blog graphics are included and editable in Photoshop so you can add your own text, colors, and backgrounds. Custom shortcodes ( testimonials, service boxes, listings, toggled and tabbed content, call to actions, alert boxes, buttons, portfolio,..). You can use them in your pages, posts or any widget (Check it out: Shortcodes).